New Year’s celebrations just aren’t the same without champagne, and mixing up champagne cocktails is one of our favorite ways to enjoy the bubbly. 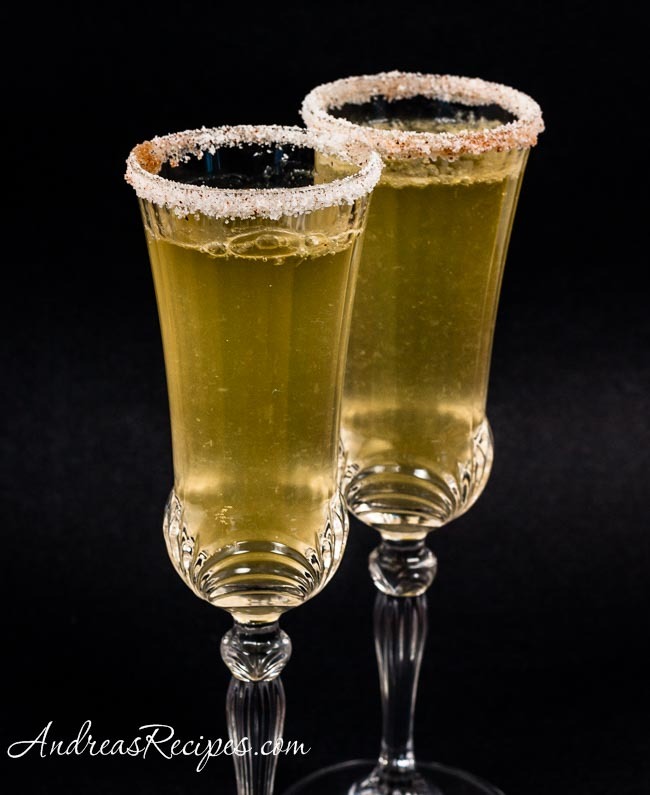 This cocktail recipe has passion fruit juice, lime juice, triple sec, and a brut cava, and the sugared rim with chili powder gives it a mix of sweet and spicy. Passion fruit juice may be tricky to track down in some areas, and I hit every single store we regularly shop at to find some. I finally had to give in and buy passion fruit nectar, a sweetened form of passion fruit juice, but I also had to read the labels because almost every brand I could find had high fructose corn syrup. La Fe brand passion fruit nectar was the only one to use regular sugar. Cava is a Spanish sparkling wine, usually white or pink, and comes in a range of dryness. 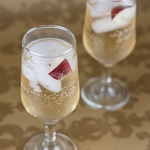 The brut cava is extra dry, which works well with the sweetness of the passion fruit juice. 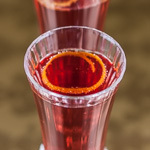 This formula makes one large cocktail, but you can also make two small cocktails, just divide the passion fruit mixture between two champagne flutes and top with brut cava. Adapted from The Bubbly Bar, by Maria C. Hunt. Combine the sugar, chili powder, and salt in a wide flat plastic container. Set aside. Rub the lime wedge around the edge of the glass. Press the rim of the glass into the chili-sugar mix to coat the rim. 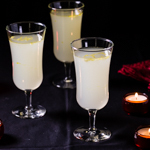 Combine the lime juice, passion fruit juice, and triple sec in a cocktail shaker with ice. Shake until well chilled, then carefully strain into the prepared glass. Top with the brut cava. Andrea, thanks for the mention here – we really appreciate it! I love passion fruit and am always on the look out for fresh fruit. It is really hard to find even the nectar out in the bay area. I am going to have to try harder, so I can make this cocktail. I love the sugar rim as it gives it a very elegant look & feel. Happy New Year to you and your lovely family!! So, glad that I had the chance to finally meet you this year!! You must have had fun “sampling” all of these! The flavors of passion fruit and chili sound pretty pretty invigorating!